Over the past few decades the Russian Museum became a complex of ensembles of palaces and gardens in the very centre of Saint Petersburg. Nowadays gardens of Russian Museum affiliate Mikhailovsky palace surrounded by the Mikhailovsky garden. Mikhailovsky (Engineers) Castle with the garden around, two towers – guardhouses – are included into the complex of Mikhailovsky (Engineers) Castle, and the Maple Alley connecting the guardhouses with the Castle, together with the Engineers Public Garden on each side of the Alley. On the corner of Nevsky prospect and Moika river the splendid Stroganovsky palace is situated. Across the Mars Field on Millionnaya street – strict Marble Palace with the reconstructed winter garden and fountain. The main garden of the Russian Museum is the Summer Garden with the Summer Palace of Peter I. The real highlight – the first building of Saint Petersburg, House of Peter I on the Petrovskaya embankment hidden in the grove of old trees. The total area of the gardens of Russian Museum and cour d’honneur of the palaces is more than 30 hectares. They all demand the constant concern and maintenance, research and preservation. In contrast to the magnificent palaces and gardens ensembles of Peterhof, Tsarskoe Selo, Pavlovsk and Gatchina that were initially designed as gardens and parks complexes. The gardens of Russian Museum were incorporated gradually in 21 century. They were transformed from the city overgrown parks into the original imperial gardens that were the beginning of Saint Petersburg. In 2000 the Mikhailovsky garden adjoining to the Mikhailovsky garden was ceded to the gardens of Russian Museum. As early as in 2003 the old city park underwent the complex restoration. 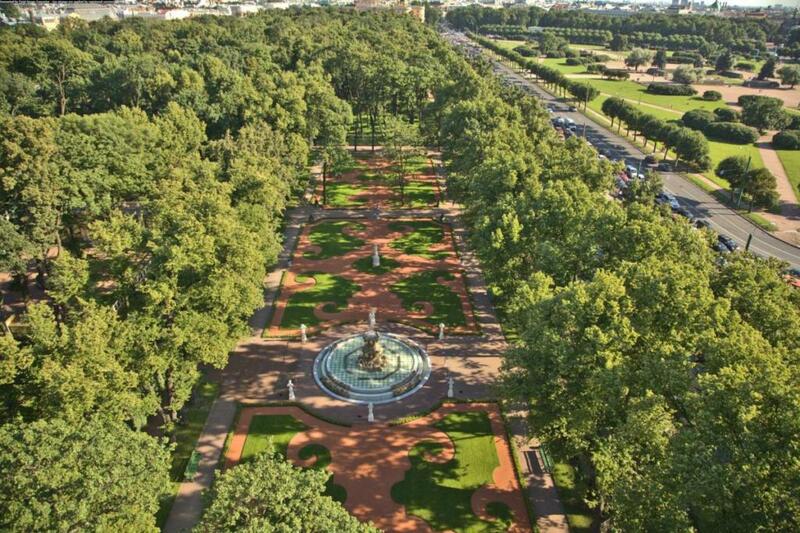 It acquired the appearance of the palace garden that has been created from the very first years of the new capital by the famous architects. In celebration of the 300th anniversary of Saint-Petersburg the garden was reconstructed as for the period of its prosperity in 1826, when it was transformed by architect Carlo Rossi in favor of the adopted fashion for the landscape gardens. The quay pavilion Rossi on the Moika embankment, the Rossi’s bridge between two ponds, the Rossi’s linden circle at the garden entrance from Sadovaya street remind us about his name. Nowadays it is a favorite place of walks of the citizens and city guests. An oasis of freshness and silence, crocuses blooming in spring and exuberant blooming of the flowerbeds during summer. It also hosts the Annual International “Imperial gardens of Russia” Festival during the White Nights. Across the Sadovaya street opposite the Mikhailovsky Garden the small garden round the Mikhailovsky Castle is laid out with the accurate square of young linden trees. Trees trimmed into green wall and exuberant blooming of white flowers of spiraea on the lawns between the smooth turns of paths. The picturesque groups of old trees still remain there. At the times of Peter the Great the Summer Garden reached the Nevsky prospect. At the times of Elizabeth the baroque regular garden was planted here at the windows of her splendid wooden window. Under Paul I the Mikhailovsky Castle was erected by his order at the place of the decayed palace. together with the parade ground encircled with a moat filled with water and the cannons on its edges. It was reconstructed on the occasion of 300th anniversary of St. Petersburg. The part of the engineering fortifications – the fragments of Resurrection channel and Threespan bridge remaining under the ground were uncovered and reconstructed. Today it is the favorite photo point for the love pairs. The wedding corteges are arriving to the castle one after another as it is one of the most significant and beautiful places in Saint Petersburg. From the Threespan bridge towards the Mikhailovsky Castle yard the Maple Alley stretches away as far as the Guardhouses that guard it on both sides. Though today mostly the chestnuts grow along the Alley. This name reminds the descendants of the original planting. On the central reserve area the equestrian statue of Peter I portrayed as Roman emperor. It was erected here by Paul I with the inscription: “great grandson to great grandfather”. The students passing by never miss a chance to jump up and touch the heel of the saved on the bas-relief “Grapple with Sweden ships at the Battle of Gangut”. The bronze on the drowning’s heel shines with gold and the students pass the exams successfully. On the lawn near the monument traditionally the squares of the carpet flower beds are laid out. The same shapes are reproduced in the Engineers’ public garden planted on the both sides of the alley. Here the citizens walk with children and dogs, or read the newspapers in the afternoon in the sunshine, the sportsmen jogging in the morning. The Summer Garden became a part of The State Russian Museum in 2004. The Summer Garden was under the restoration from 2009 till 2012. The 6-years project based on the archive and archeological data. Many objects were reconstructed on the basis of first drawings. The impressive elements of the garden art and amusement objects of XVIII appeared in the garden, brought to Russia by the first Russian Emperor Peter the Great. 27 may 2012 the renovated Summer Garden – the contemporary of Saint Petersburg and the first imperial garden of Russia – opened its gates for the citizens and guests of Saint Petersburg. The grand ceremony was opened by the governor Grigory Poltavchenko. It became a main event in the frames of the celebration of City Day. Finally the visitors could see and appreciate the huge reconstruction work that was carried out just in three years by the landscape specialists, restorers and research specialists of the museum. The objects typical for XVIII century returned to the garden: four central bosquets of Peter I period – Cross arcade – as a symbol of statehood in the shape of St. Andrew’s flag. Menagerie Pond with summerhouse – the place of thought of great reformer Peter. “Poultry yard” with Pigeons House, “French” bosquet with sculpture of sitting fable writer Krylov in the centre. The exotic plants in tubs and vases appeared again in bosquets and on Grand parterre and stored in Small Greenhouse near the Red Garden in winter. The four fountains on Main Alley, three in bosquets and the largest and the most decorated “Crown fountain” on Grand parterre were reconstructed. Eight kilometers of trimmed espalier are planted along the perimeter of bosquets to make the composition of ensemble complete. The huge and complex work on restoration and duplication of marble sculpture was carried out. The copies are now in the garden and the original statues are in the exposition of the Russian Museum. Such a complex restoration of historical object is for sure unique even by European standards. It gives the exclusive experience for a number of specialists’ generations of many fields: historians, restorers, art historians, landscape specialists. Today the Summer garden is an integral part of the splendid ensemble of Petersburg. It is not only the Russian cultural heritage, but the world cultural site.